Every few years some band or singer is accused of stealing a song. In 2009 guitarist Joe Satriani sued Coldplay, claiming the band plagiarized his song “If I Could Fly” for their hit single “Viva La Vida.” Coldplay denied the allegation saying the similarities were coincidental. Given that rock, pop and jazz musicians use common chord progressions, it shouldn’t be too surprising when different songs sometimes sound alike. 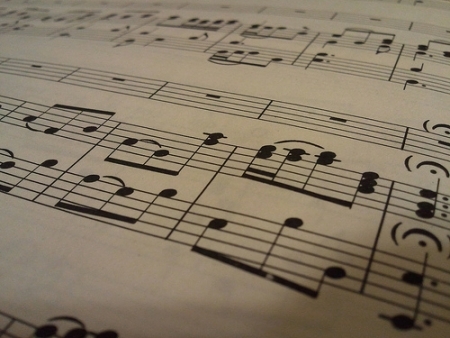 In other cases, musical similarities are due to innocent, unconscious borrowing. Because most musicians and songwriters want to create something new and original, I suspect outright musical theft is rare. This week on SDPB Radio’s Big Band Spotlight, we’re featuring a few examples of jazz and big band songs that sound remarkably similar to other pre-existing songs. In early 1946, Stan Kenton recorded a catchy number by trumpeter Ray Wetzel called “Intermission Riff.” As many others have noted, the main theme of “Intermission Riff” is the same as the opening theme heard in Gerald Wilson’s “Yard Dog Mazurka,” recorded by the Jimmie Lunceford orchestra five years earlier. But where Wilson discards the theme right away and moves onto other things, the Kenton band sticks with it and develops counter-riffs. The similarity of the two themes gave Kenton’s many detractors something extra to pillory him for, but as Kenton’s biographer Michael Sparke points out, musicians pick up ideas and motifs from many sources, often stored in the subconscious, and their subsequent use does not necessarily imply plagiarism. But that was the charge pianist and composer Mary Lou Williams leveled against the songwriters of “Black Coffee.” The melody to the popular torch ballad is remarkably similar to that of Williams’ composition, “What’s Your Story, Morning Glory,” recorded in 1938 by the band she arranged for, Andy Kirk and his Twelve Clouds of Joy. Williams said her song came about through a correspondence with Jimmie Lunceford trumpeter Paul Webster. One of his letters began “What’s your story morning glory? I haven’t heard from you,” and Williams used that to develop a song. Since she wouldn’t have written the song without his letter’s inspiration, she gave Webster partial songwriting credit. 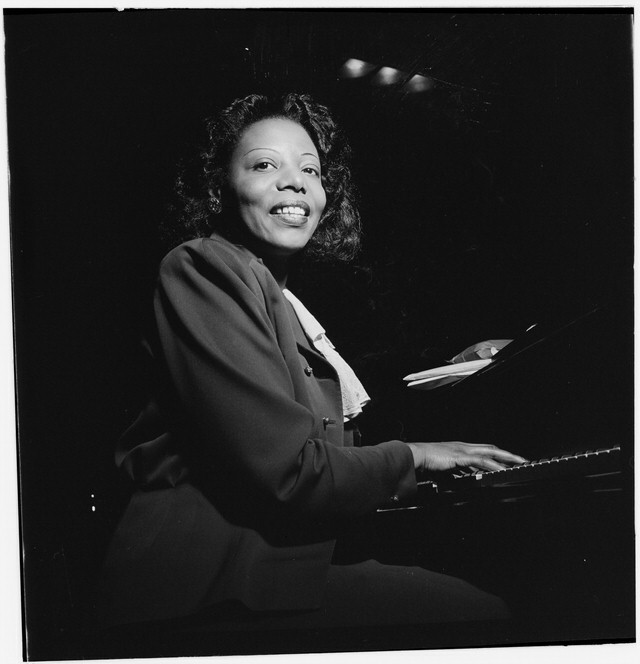 But several years later Williams accused Webster of taking her melody, adding a bridge with collaborator Sonny Burke and claiming it was a new song. Williams fought for compensation for what she considered plagiarism, but in the end she apparently settled for just $300. One of the more notorious examples of suspected musical theft in jazz is tenor saxophonist Jimmy Forrest’s “borrowing” of a blues riff from Duke Ellington’s “Happy-Go-Lucky Local” for his 1951 rhythm and blues hit, “Night Train.” Forrest played in the Ellington orchestra for a few months in late 1949 and early 1950; according to Ellington’s manager, Cress Courtney, there was a problem and Forrest was let go. In retaliation, Courtney believed, the tenor man took Ellington’s theme as his own. One of the stranger musical doppelgangers is one separated by decades and a continent. In 1927 Louis Armstrong recorded “Struttin’ with Some Barbecue” on one of his classic Hot Five sessions. Three decades later a very similar theme turned up in “Samba de Orfeu,” one of the songs Brazilian guitarist Luiz Bonfa wrote for the 1959 film, Black Orpheus. That soundtrack also included music by Antonio Carlos Jobim and introduced listeners outside of Brazil to the Bossa Nova. The uncanny resemblance of the two songs hasn’t been lost on musicians over the years. The great alto Saxophonist Paul Desmond recorded “Samba with Some Barbecue” in 1968. More recently clarinetist and saxophonist Anat Cohen put the two songs together on her excellent 2007 album, Noir. Back to Stan Kenton: He wasn’t trying to fool anyone regarding the musical source of his 1945 record, “Southern Scandal.” He acknowledged that it came from Max Steiner’s “Tara’s Theme” from the Gone with the Wind film score. Kenton titled his composition “Southern Scandal” because, he said, the movie was based in the deep south and about a scandalous relationship. Kenton took Steiner’s sweeping, wistful theme and turned it into a cacophonous, brass blasting number. Here’s a Soundies video performance of “Southern Scandal” featuring Kenton, piano and Eddie Safranski, bass. Two years before Pearl Harbor and just as both Miller band and the Andrews Sisters were on the verge of superstardom – to use an unfortunate modern term – they appeared together on a series of radio programs sponsored by Chesterfield cigarettes. This week on SDPB Radio’s Big Band Spotlight we’re featuring highlights from those broadcasts. 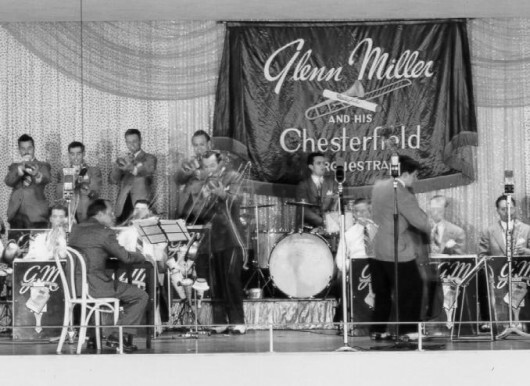 Miller’s Chesterfield broadcasts began on December 27th, 1939. After several years of scuffling, the Miller band finally broke through in the summer and was now one of the top bands in the country with “In the Mood” topping the charts. Yet there were some doubts as to how well the Miller band would carry a radio program, so producers hedged their bets and added the Andrews Sisters, who had already proven themselves as a popular act. Miller and the Andrews had more in common than just being two of the most popular musical acts of the 1940s. They were both more entertainers than artists. And they both came from the Midwest. Miller was born in the small, southwestern Iowa town of Clarinda and spent much of his early life in Nebraska. The Andrews Sisters grew up in the small town of Mound, Minnesota near Minneapolis. Miller paid his dues working as a trombonist and arranger with countless bands through the 1920s and 30s; playing alongside Tommy Dorsey, Benny Goodman, Jack Teagarden and other future big band stars. He formed his own orchestra in 1936, but it took him three years of struggle and frustration before he found success. LaVerne, Maxene and Patty Andrews were the daughters of a Greek father and a Norwegian mother. As young girls they sang together in local talent shows and school revues before joining a large, traveling troupe of entertainers in 1931 when the youngest, Patty, was just 13. They spent the next several years on and off the vaudeville circuit. In 1937 they arrived in New York with the Leon Belasco Orchestra, who introduced the Andrews to arranger Vic Scheon who hooked them up with an orchestra broadcasting from a hotel ballroom. Dave Kapp, the president of Decca Records, caught the broadcast and signed them up. As luck would have it, the sisters were presented with a song adapted from Yiddish theater, “Bei Mir Bist Du Schon. The Andrews recorded it in November 1937 with an orchestra arranged and conducted by Vic Schoen. It was a big hit and the Andrews were on their way to becoming the most successful singing group of their time. The success of “Bei Mir Bist du Schon” basically set the style for the Andrews Sisters’ music career. They stuck closely to a two-beat Dixieland feel instead of the 4/4 swing of the Miller orchestra and just about every other major orchestra of the big band era. They sang in a chipper, upbeat fashion with oldest sister LaVerne always singing the low harmony, middle sister Maxene singing the upper harmony and baby sister Patty taking the lead and the solo parts. And it didn’t matter what they were singing: novelty numbers, foreign tunes, good songs, bad songs, they always gave them the same treatment. While this approach brought them tremendous success, it makes listening to several of their records in a row rather tiresome today. The sameness of the rhythms, vocal lines and bright energy quickly becomes tedious. However in the days of 10 inch 78s, before long-playing albums, people rarely listened to more than one or two songs by an artist at one time. 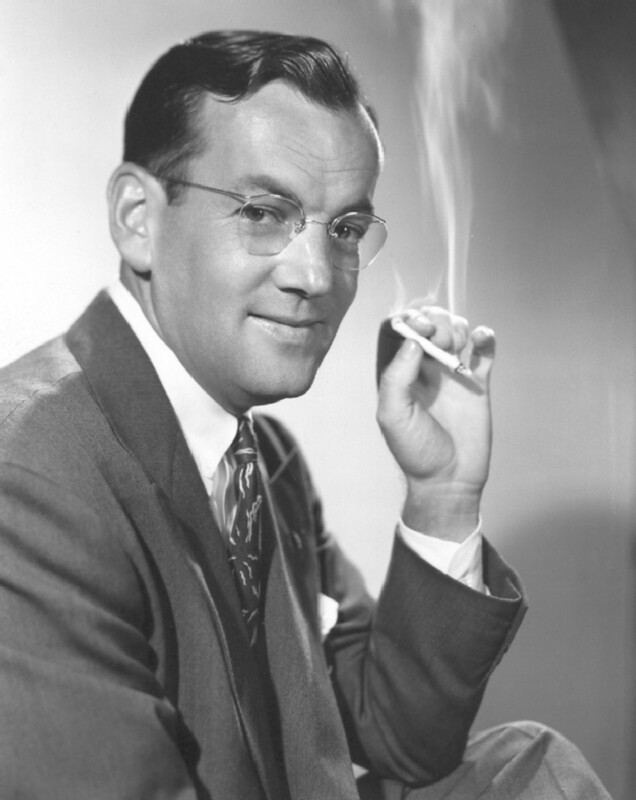 Even during the fifteen-minute radio broadcasts with the Glenn Miller band, the Andrews only did one song, so hearing a number of their performances at once is rather unfair and doesn’t really present them in the best light. The teaming of the Miller band and the Andrews Sisters was not a match made in heaven. The Chesterfield radio shows were only fifteen minutes long, which, with commercials and everything else, left only about twelve minutes for music. The Andrews Sisters refused to cut their arrangements and insisted they be performed exactly as recorded. The sisters were infamous for not getting along and after a few weeks into the radio program, they weren’t even talking to each other. Miller and the show’s producers had a hard time figuring out what they wanted to sing. Apparently the Andrews Sisters weren’t like the battling Dorsey Brothers. Jimmy and Tommy Dorsey had an intense rivalry that sometimes deteriorated into physical fights, but according to those who knew them, there was still love and respect. Patty and Maxene Andrews seem to have truly hated each other; it was only LaVerne who held them all together. Adding to the fights they had among themselves were the conflicts they had with their father. When the Chesterfield show with the Miller band began in late December 1939, the sisters were living with their parents in a suite at the Picadilly Hotel. Their father, Peter, wasn’t happy with the men 24-year-old Maxene and nearly 22-year-old Patti were dating. The sisters moved out on January 28th and two days later there was a serious family fight in the Andrews’ suite that left Peter Andrews spending the night in jail. Only Patti showed up for the January 30thChesterfield broadcast. As the weeks went on, it was obvious that twelve minutes was just not enough time to present properly the full Glenn Miller Orchestra and the Andrew Sisters. The battling among LaVerne, Maxene, and Patty only added to the friction and tension and their thirteen week contract wasn’t renewed. Glenn Miller continued without them and quickly proved that his band didn’t need the sisters to help carry the show. 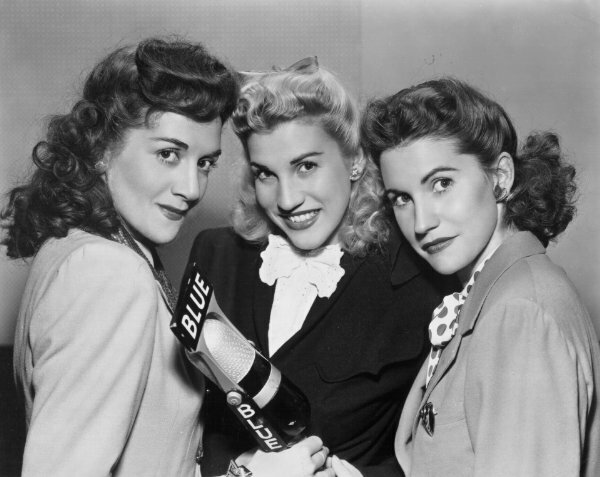 The final radio program featuring the Andrews Sisters with the Glenn Miller Orchestra aired on March 21st, 1940. Although their paths never crossed again, once the U.S. entered World War Two, both Miller and the Andrews tirelessly dedicated themselves to the war effort. The sisters entertained at military bases, hospitals and munitions factories and often treated servicemen to dinner. They were also regularly singing at the Hollywood and Stage Door Canteens. Glenn Miller broke up his immensely successful orchestra in September 1942 and joined the Army Air Force and organized a fifty-piece service orchestra that performed for troops and broadcast a weekly recruitment program, I Sustain the Wings. In the summer of 1944 Miller took his orchestra overseas to perform for allied troops in England. He lost his life in December when his plane was lost over the English Channel during a trip to Paris in advance of his band. Here’s Glenn Miller and his Orchestra playing “In the Mood” as featured in the 1941 movie Sun Valley Serenade starring John Payne and Sonja Henie. This is a rare opportunity to watch the Miller band in action, even if it was staged for movie cameras. Tex Beneke and Al Klink are the dueling tenor men. Billy May takes the trumpet solo. Maurice Purtill is the drummer and Trigger Alpert is on bass. Romantic lead Payne pretends to play the piano. And here are the Andrews Sisters performing “Boogie Woogie Bugle Boy” in the 1941 Abbott and Costello comedy Buck Privates. It seems rather bizarre today, but back in the 1930s record companies didn’t want their records played on the radio. The assumption was people wouldn’t buy records if they could hear them for free over the airwaves. Record labels even had the words “not licensed for radio broadcast” printed on them. To fill the need for recorded music, stations turned to transcription recordings specially licensed for broadcast and unavailable to the public. This week on SDPB Radio’s Big Band Spotlight we’re featuring a handful of transcription performances by several classic bands. The controversy over playing commercial records on the radio is understandable in the context of the times. The record industry had all but collapsed in the early days of the Depression while the new medium of radio was thriving and growing. The American Federation of Musicians believed that broadcasting records was not only taking away royalties, but also killing jobs. In retrospect it’s easy to see that the union and record companies were working against their own best interests in the face of a new technology. (Sound familiar today?) Throughout the Swing Era there were constant skirmishes among record companies, radio networks, the musicians union and music licensing organizations, usually to the detriment of both those who played music and those who listened to it. 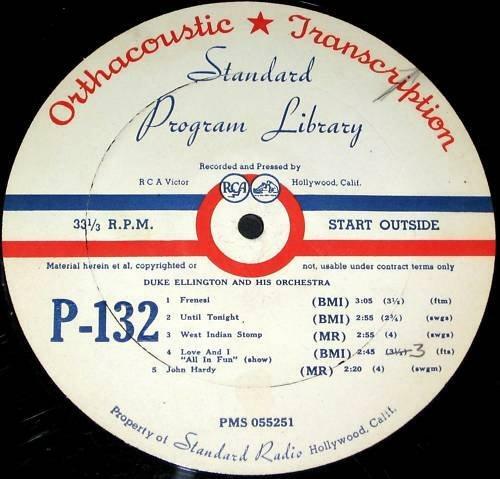 10-inch 78 with the slogan "Not Licensed for Radio Broadcast"
The transcription recordings captured many arrangements and songs bands didn’t otherwise record, and often in looser performances done in one take. The fidelity was usually better than that heard on commercial 10-inch 78s. And because the playing time wasn’t limited to the three-and-a-half minutes available on regular records, transcriptions often featured longer tracks. But even though commercial 78s had “not licensed for radio broadcast” printed on the label, that didn’t stop radio stations from playing them over the air. Martin Block had been playing records he bought at a local store on WNEW’s Make Believe Ballroom program since 1935. (His show created the illusion of live big band broadcasts.) Veteran bandleaders Paul Whiteman and Fred Waring were angered by this practice and filed suits against radio stations for playing their records without permission or compensation. But the Second Court of Appeals dismissed Whiteman’s suit and the Supreme Court refused to hear the appeal in December 1940. This meant that property rights ended with the sale of a recording. Broadcasters were free to play commercial records on the air, no matter what the label said. Although they limped along for a few more years, the radio transcription services were pretty much done for by the middle of the next decade. Record companies had long since realized that playing records on the air actually boosted sales and were now sending promo copies of their records to stations. Getting records on the radio was so vital in creating hits that companies paid to have them played on the air – an illegal practice that didn’t end with the Payola scandals. The bulky 16-inch transcription discs were also killed off by the development of 12-inch, microgroove LP records that formed the cornerstone of most radio station’s music libraries. The original transcription discs were never intended for the public, but over the years the libraries of World, Thesaurus, Standard, Lang-Worth, C.P. MacGregor and other transcription services have been purchased by small, specialty labels and released on records and CDs. 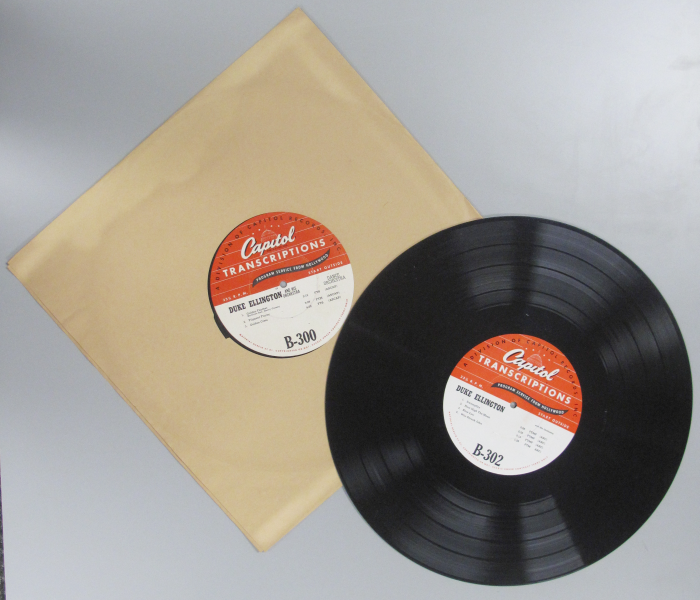 These are especially valuable for making available recordings by Jan Savitt, Hal McIntyre, Charlie Spivak and other lesser-known big bands whose commercial records the majors have no interest in re-releasing. The most joyous of all jazz styles has to be that rollicking form of blues piano known as boogie-woogie. During the Swing Era, big bands took boogie-woogie, dressed it up in brass and saxophones and ignited a new musical craze. Even when the authentic boogie style got lost in the mix, its infectious rhythm and good humor always remained. This week on SDPB Radio’s Big Band Spotlight, we’ve got a variety of big band boogie, from somewhat authentic adaptations to novelties that have only a tenuous relation to the original boogie-woogie form. Musicologists have traced the roots of boogie-woogie to northeast Texas where African-American pianists played it in logging and turpentine camps as early as the 1870s. The arrival of railroads helped spread the boogie style and the shuffling rhythm of trains and the cry of their whistles influenced the sound of the music. It spread to Arkansas, Louisiana, Missouri and eventually Chicago, which became the center of boogie-woogie music. With a strong, repetitive bass patterns in the left hand providing a solid beat, boogie-woogie was music for dancing and played at smoky roadhouses, juke joints and house rent parties. The first boogie piano records were made in the 1920s, most notably Chicago pianist Meade Lux Lewis’ 1927 recording of “Honk Tonk Train Blues” and “Pinetop’s Boogie Woogie,” recorded in Chicago in 1928 by Alabama-born pianist Pinetop Smith. “Pinetop’s Boogie Woogie” was a commercial hit, but Smith didn’t get a chance to enjoy its success. He was shot in a Chicago dance hall and died the day before his second scheduled recording session. Lewis slipped into obscurity until talent scout and record producer John Hammond heard a copy of “Honky Tonk Train Blues.” He spent two years trying to find the pianist and finally located Lewis in Chicago washing cars for a living. 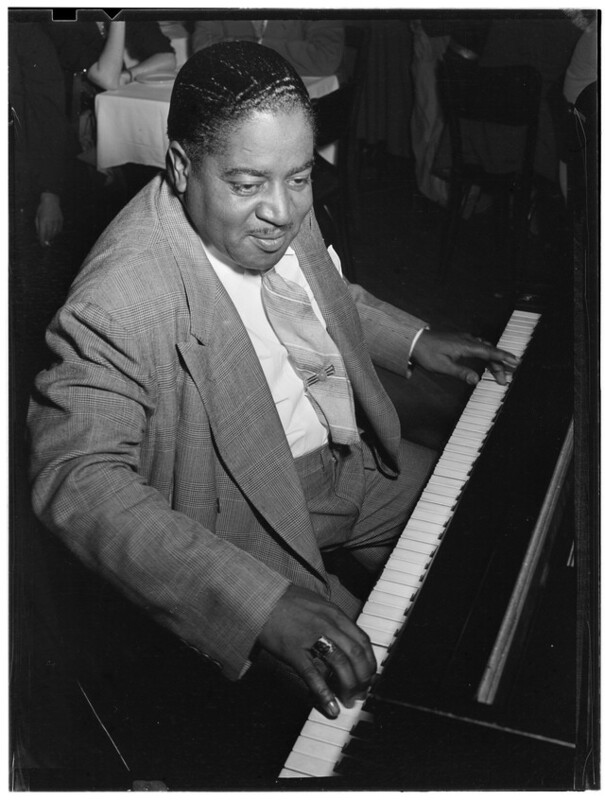 Hammond got Lewis back into the recording studio and teamed him with fellow boogie pianists Albert Ammons and Pete Johnson for the From Spirituals to Swing concert at Carnegie Hall on December 23, 1938. Here’s Meade Lux Lewis playing some pure, unadulterated boogie-woogie in a clip from a mid-40s film short. The Dorsey record was only a modest success when it first came out, but it became one of the biggest hits of the Swing Era when re-released in late 1942 during the American Federation of Musicians’ infamous recording ban. While Dorsey and his men sound a little stiff and anemic in comparison to the rocking swing of the real boogie-woogie pianists, they still create an infectious, bouncy energy of their own. 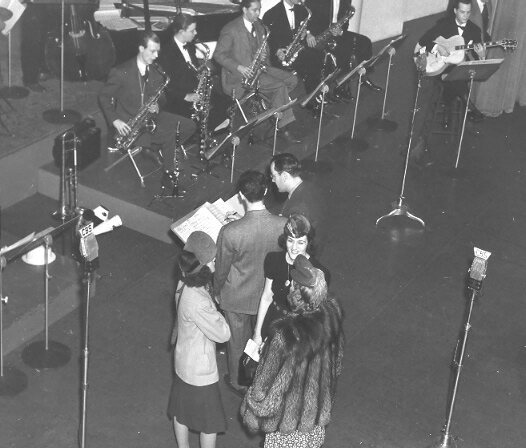 This is a later edition of the Dorsey band circa 1950 playing “Boogie Woogie.” The arrangement is updated from the original 1938 recording, but it still features Dorsey’s bluesy trombone in the final chorus. The boogie-woogie craze hit its peak in the early 1940s when every big band had to have at least one boogie tune in the book. But the band that really milked boogie-woogie ’til the cow was nearly dry was the orchestra co-led by trombonist Will Bradley and drummer Ray McKinley and featuring pianist Freddie Slack. After the hit record “Beat Me Daddy, Eight to the Bar” turned the Bradley/McKinley orchestra from an also-ran into one of the top bands in the country, they made an endless series of boogie novelties with increasingly ridiculous names: “Rock-a-Bye the Boogie,” “Scrub Me Mama, With a Boogie Beat,” “Chicken Gumboogie,” “I Boogied When I Should Have Woogied” and “Booglie Wooglie Piggy.” Surprisingly, the records aren’t as bad as the titles suggest even though some of them only have a remote relation to real boogie-woogie music. Here’s a clip of a sextet from the Bradley/McKinley big band playing “Basin Street Boogie.” The pianist is Billy Maxted who joined after Freddie Slack left to form his own orchestra. After pop hits like the Andrews Sisters’ “Boogie Woogie Bugle Boy” and “Cow Cow Boogie” by Freddie Slack and Ella Mae Morse (neither song a real boogie-woogie), the boogie fad faded away. However, the musical influence of boogie-woogie continued. 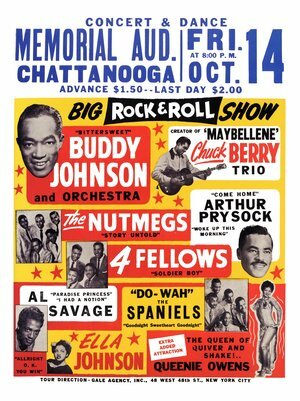 It provided the foundation for rhythm and blues and later early rock ‘n’ roll and rockabilly. In fact, that old 1928 record of “Pinetop’s Boogie Woogie” is considered by some music historians to be the very first rock record. Do you want some more boogie-woogie? Here’s Albert Ammons and Pete Johnson in a clip from the 1944 film shortBoogie Woogie Dream. Ammons is on the left and Johnson the right. Lena Horne does the introductions. Although Pete Rugolo spent much of his career scoring background music for television and movies, he ranks among the most important and original big band arrangers. As the chief arranger of Stan Kenton’s orchestra at its peak of popularity in the mid-to-late 1940s, Rugolo wrote a stunning array of music that varied from thunderous, brassy swingers to thorny, challenging avant-garde works. Rugolo’s special gift was ingeniously mixing instruments to create rich, dynamic scores filled with surprising colors and textures. Pete Rugolo died on October 16th at the age of 95. This week on SDPB Radio’s Big Band Spotlight we’re remembering the arranger/composer with music from his Stan Kenton years through his early days writing for television and movies. Rugolo spent his career in the uniquely American worlds of jazz and Hollywood, but he was born in Sicily in 1915. When he was five his family came to the U.S. and settled in Santa Rosa, California. Young Pete learned the French horn and piano and earned his bachelor’s degree in music education from San Francisco State College. He was then admitted to Mills College, a women’s college in Oakland, where he studied with renowned composer Darius Milhaud who had just fled France ahead of the Nazi invasion. But along with his classical schooling, Rugolo loved the sounds of Duke Ellington, Jimmie Lunceford and the other big bands he heard all around on records and the radio. Rugolo was drafted in the army just as Stan Kenton’s first records were coming out. He was so enamored with them that he copied out the arrangements note for note and began writing his own scores in the aggressive, thunderous Kenton style. He sent them to Kenton who liked them enough to give Rugolo a standing invitation to join the band once he got out of the service. The Kenton band recorded its first Rugolo arrangements at the end of 1945, around the time Rugolo was back in civilian clothes. 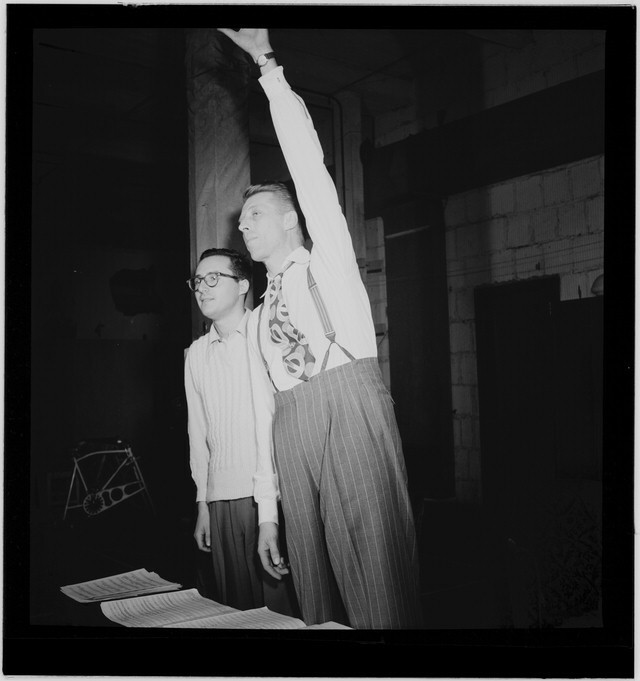 At first his charts were closely patterned after Kenton’s, but the bandleader told Rugolo he didn’t have to do that and could write whatever he wanted. Soon Rugolo emerged as the band’s chief musical architect as Kenton dedicated more of his time tending to the business of running one of the top bands in the country. Even though Rugolo relieved Kenton from his arranging and composing responsibilities, the pressure was still so overwhelming that the bandleader suffered a a nervous breakdown and disbanded in the spring of 1947. After a short break, Kenton came back with a new orchestra he billed as playing “Progressive Jazz.” Kenton’s goal with his new group was to bring together jazz and classical music in the creation of a new American concert music. With his background as a big band arranger schooled in contemporary symphonic music, Pete Rugolo was the perfect person to help realize Kenton’s vision. With Kenton’s support, Rugolo unleashed his creativity and wrote a series of startling, uncompromising and often avant-garde pieces. Kenton’s audiences weren’t crazy about Rugolo’s more modernistic pieces and some musicians in the band didn’t really care for them either; they wanted to play music that swung. But Kenton wasn’t interested in leading a swing band. He was after something more ambitious. While Kenton butted heads with his later arrangers (often over the concept of swing), there were no personality clashes with the soft-spoken Rugolo. As Kenton biographer Michael Sparke notes, both were committed to the same musical goals. Rugolo admired and respected Kenton and felt fortunate to have the freedom to compose without any restrictions. At the end of 1948, Stan Kenton disbanded for a second time, again exhausted by the endless grind of being on the road playing one-nighters. 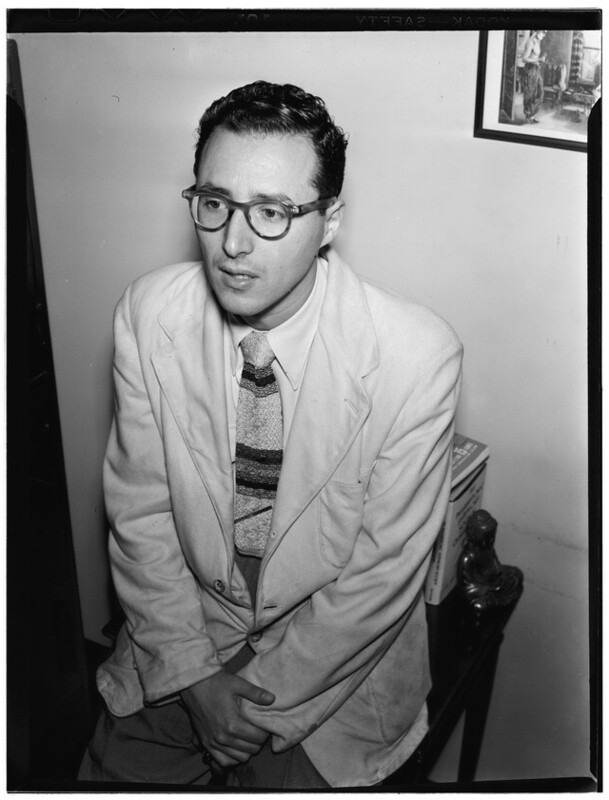 Pete Rugolo got a job as East Coast music director of Capitol Records, Kenton’s label. During Rugolo’s short time with Capitol, he was responsible for much of the label’s modern jazz recordings, including Miles Davis’s legendary Birth of the Cool sessions. He also arranged for Capitol’s singers, including Nat “King” Cole with whom he recorded the classic recording of “Lush Life,” turning Billy Strayhorn’s boozy tale of lost love into an impressionistic tone poem. Rugolo collaborated in the creation of another vocal masterpiece when he arranged Bill Barnes’ “Something Cool” for ex-Kenton singer June Christy. As on “Lush Life,” Rugolo’s colorful orchestration makes the song’s story vivid and real. In the early 50s, Rugolo moved back to California with the goal of writing for the movie studios. At first he had difficulty finding any work – Rugolo said producers were afraid to use him because he had a reputation for composing wild music. He eventually got a job with M-G-M and wrote some jazzy scores, but his work was mostly uncredited. In 1954 he was signed by Columbia Records and began making records under his own name, using top West Coast studio musicians and jazz all-stars, including fellow Stan Kenton alumni. On his Columbia records, Rugolo combines a variety of instruments to create a rich spectrum of colors and textures. At the core, Rugolo is working with a standard big band, but he adds flutes, oboes, tubas and French horns and tuned percussion. When writing for Kenton, Rugolo’s music was often sober and serious, but on his own records he reveals a playful sense of humor. Rugolo stopped making records in the early-60s and concentrated more on writing for television. He composed the themes for the Richard Diamond, Private Detective, The Fugitive, and Run for Your Life. Along with Henry Mancni, Rugolo was a pioneer in bringing the sounds of big band jazz into television scores, especially in music written for crime dramas. Rugolo also wrote background music for Leave it To Beaver, Lost in Space, Hawaii Five-O, M*A*S*H and countless other TV series and TV movies through the 1980s. Surprisingly, he didn’t write much for film which was his ambition when he first went to Hollywood. However his last score was for the 1997 movie thriller, This World, Then the Fireworks. 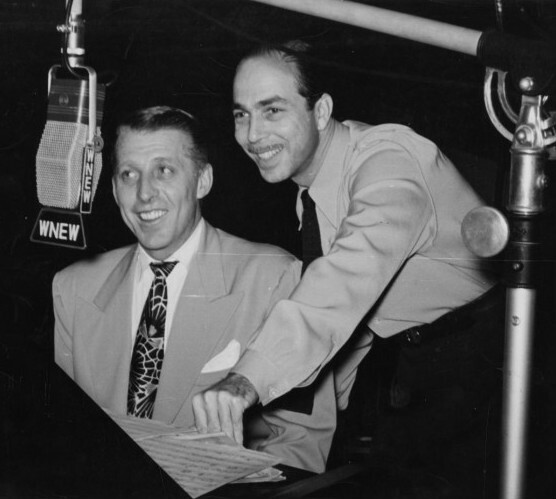 Although Rugolo only spent some four years with Stan Kenton, it will be the music he composed for Kenton for which he’ll be best remembered. Even after leaving Stan Kenton’s employ in 1948, Pete Rugolo continued to write for his former boss and his admiration and veneration for him never wavered. Here’s a video of Pete Rugolo during a 1999 recording session leading a big band playing one of his old Kenton arrangements, “Minor Riff.” The trumpet section includes Buddy Childers who played on the original Kenton record. During the Swing Era it seemed like all trumpet soloists were required to sing, whether they had much of a talent for it or not. Essentially they were just following the model set by Louis Armstrong. But even if other trumpeters couldn’t match Armstrong as a vocalist, they still sound better than many of the “real” singers of the day and often add a dose of lighthearted entertainment to their music. This week on SDPB Radio’s Big Band Spotlight we’re featuring a baker’s dozen worth of jazz trumpeters who also stepped up to the mic for a little vocalizing. It’s always fun to see these legendary performers in action, so I’ve found a few videos worth sharing of a few of the singing trumpeters heard on the show. 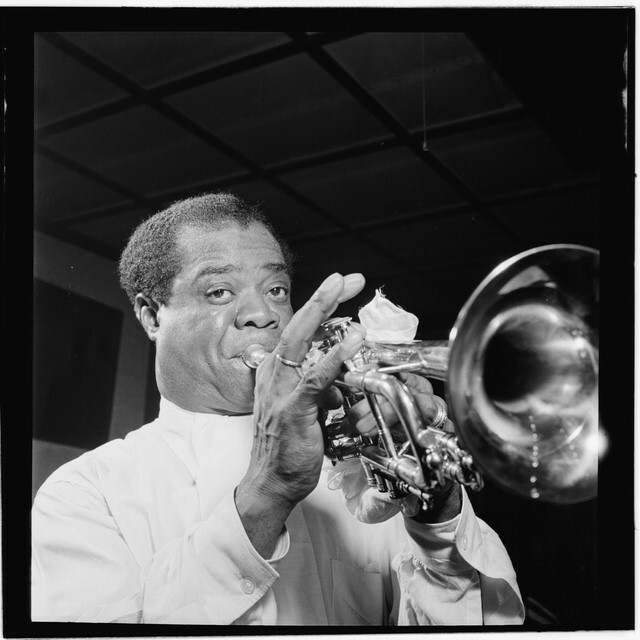 It’s impossible to overstate Louis Armstrong’s musical importance. He all but invented the rhythmic language of swing and established the soloist as the primary focus of jazz. Without Armstrong, music of the 20th century would have been very, very different. Armstrong’s influence wasn’t limited to the trumpet; he pretty much created the jazz vocal style as well. And he did it with a gravelly voice that was startling to listeners in the late 20s and early 30s who had never heard anything like it before. Louis Armstrong’s image these days is that of the lovable old man singing “Hello Dolly” and not the young, daring musical revolutionary. Fortunately the younger Armstrong was filmed on a Copenhagen sound stage during his 1933 European tour performing three songs, including “Dinah.” Armstrong’s singing and playing is filled with melodic and rhythmic inventions that are the very definition of swing. It’s a tremendous experience watching the thirty-two year old Armstrong in action. While Louis Prima, Louis Armstrong and Wingy Manone had long, successful careers, trumpet star Bunny Berigan’s was cut short by a dependence on alcohol. Berigan, a Wisconsin native, was one of the top trumpeters of the swing era with a style that was both driving and lyrical. He had a clear, powerful sound and liked to explore the lowest notes on his horn. He was a key member of Benny Goodman’s Orchestra during its historic 1935 tour to California and later waxed some memorable, concise solos on Tommy Dorsey’s classic sides “Marie” and “Song of India.” In 1937 Berigan was a top swing star leading his own big band. Far and away his orchestra’s best-known record is a brilliant performance of “I Can’t Get Started.” It features Berigan’s majestic trumpet and endearing, untrained vocal, which really captures the vulnerability of the song’s lyrics and Berigan’s life. As Gunther Schuller notes in his book The Swing Era, the human voice – particularly the amateur voice – is the most personal of all instruments and it’s virtually impossible to hide anything behind it. Berigan’s singing is a window into his soul. Berigan’s big band never really got started and fell apart in early 1940. He rejoined Tommy Dorsey for a short time before hitting the road with another big band that never made it. By June of 1942, it was all over and Berigan was gone at the age of 33, one of jazz’s tragic legends. Here’s “Red” Allen and his jumping 1946 sextet performing “The House on 52nd Street.” The trombonist is the great J.C. Higginbothom, a tremendous blues player. Both Allen and Higginbothom deserve to be much better known. The alto saxophonist is Don Stovall. More than anyone else, the outstanding trumpeter of the Swing Era was Roy Eldridge. He was the first major trumpet soloist to break away from the Louis Armstrong influence, perhaps because his early models were saxophonists Coleman Hawkins and Benny Carter. Where Armstrong’s solos had a logical melodic structure, Eldridge’s were wild with exuberant daring. Eldridge first recorded with the Teddy Hill Orchestra in 1935 before joining Fletcher Henderson’s newly reformed band. While widely admired by fellow musicians, Eldridge didn’t become a swing celebrity until he joined drummer Gene Krupa’s big band as its star soloist and sometimes singer. He wasn’t much of a singer, though. He often sang with a rather pinched, strained voice. The record that really made Eldridge famous was 1941’s “Let Me Off Uptown,” which also brought singer Anita O’Day to the public’s attention. The era of singing trumpeters – and singing saxophonists and trombonists – started coming to an end with the waning of the Swing Era. It could have been because modern jazz wasn’t as easy to sing, or because jazz musicians were taking themselves much more seriously and didn’t see themselves as entertainers. Of the boppers, Dizzy Gillespie was the one exception. He was without a doubt an exceptional, innovative musician, but he was also one of jazz’s great entertainers, following after Louis Armstrong, whom the younger trumpeter initially dismissed and denigrated before belatedly acknowledging the huge musical debt he and everyone else owed Armstrong. Part of being an entertainer was stepping up to the mic and singing, but Gillespie wasn’t much of a vocalist. He had a limited, unpolished voice, but it was an expression of the playful, humorous side of his personality. Here’s Gillespie and his big band with the novelty tune “He Beeped When He Should Have Bopped.” Milt Jackson is playing the vibes. Modern jazz produced only one great singing trumpeter: Chet Baker. After him, the tradition of singing horn men pretty much came to an end. 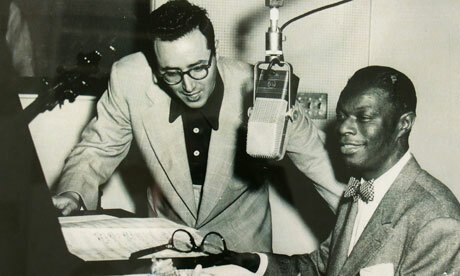 Miles Davis summed up the new attitude when he said that as much as he loved Gillespie and Armstrong, he hated the way they laughed and grinned for the audience. Their clowning may be a dated relic of an earlier time, but perhaps if jazz musicians hadn’t given up singing and providing a little entertainment, jazz would have a bigger audience today. As Louis Armstrong, Dizzy Gillespie, Fats Waller and others demonstrated, you can create great, timeless music and still be entertaining. A favorite game of some music fans is picking the first rock ‘n’ roll record. Roy Brown’s 1947 record of “Good Rockin’ Tonight” is often cited. 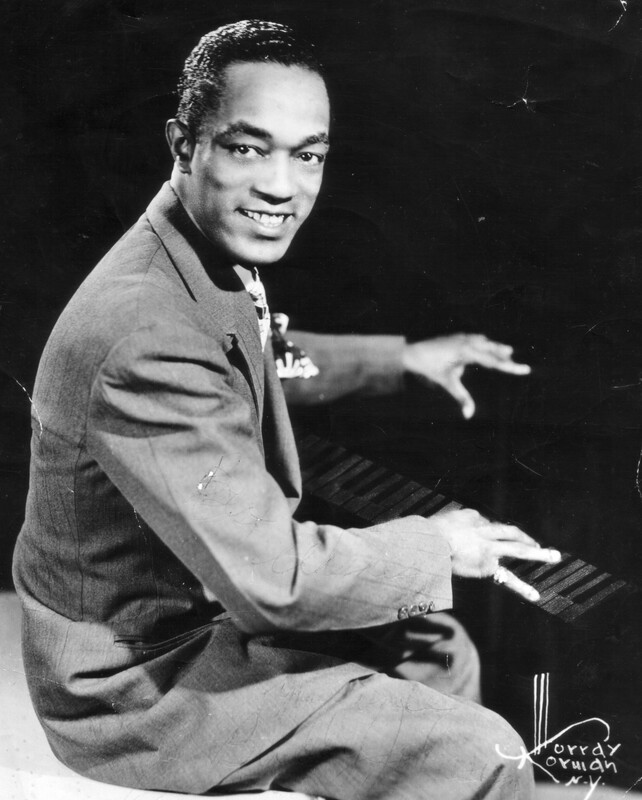 Others trace rock’s origins back to pianist Pinetop Smith’s 1928 classic, “Pinetop’s Boogie Woogie.” The two decades between those records coincide with the Big Band Era and the nascent sounds of rock ‘n’ roll are also heard in records by Count Basie, Benny Goodman, Lionel Hampton and others. But no other big band leader captured the transition of swing to rock ‘n’ roll quite like pianist/arranger Buddy Johnson. Johnson’s lack of recognition is mostly due to the fact that his heyday came at a time when the U.S. was still racially divided. His popularity was mainly limited to black audiences, especially at Harlem’s famed Savoy Ballroom and throughout the South on the so-called “Chitlin’ Circuit.” His records weren’t played on mainstream pop stations so he was mostly unknown to white listeners. Johnson was born in South Carolina in 1915 and at the tender age of four was already learning the piano. By the time he reached high school he was writing musical revues for school and church groups. 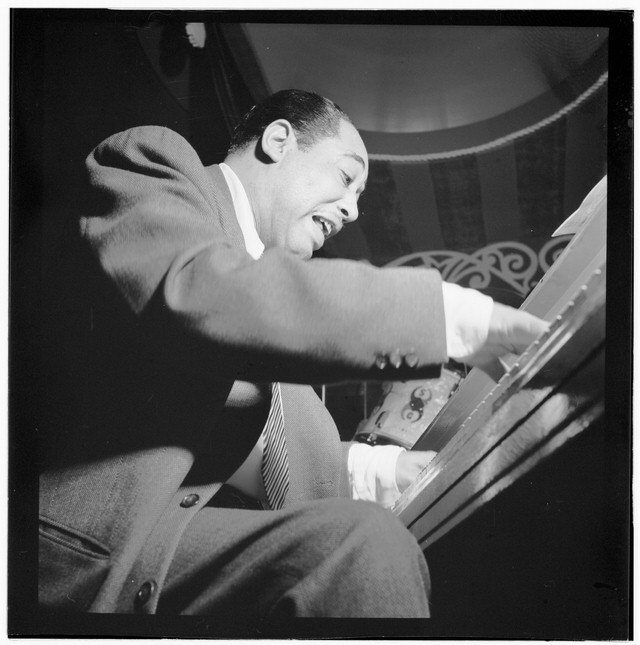 Johnson moved to New York City in 1938 to establish himself as a professional musician and quickly landed a job as pianist with a traveling Cotton Club show, which played in Europe just as World War Two was breaking out. Back in the U.S., Johnson was performing with a small combo in a Greenwich Village Club where he was noticed by a talent scout for Decca Records, which had a rich roster of African-American artists. 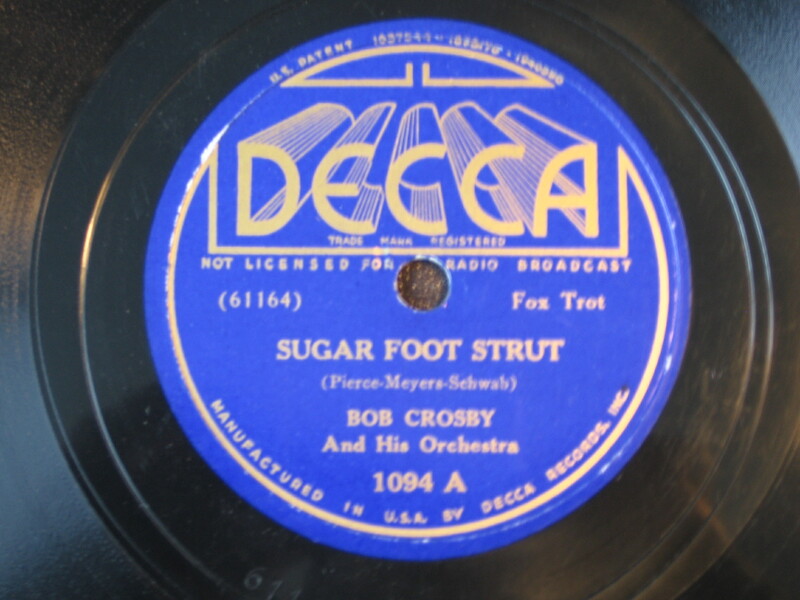 Decca signed him up and Johnson made his first records for the label with a small combo in the fall of 1939. 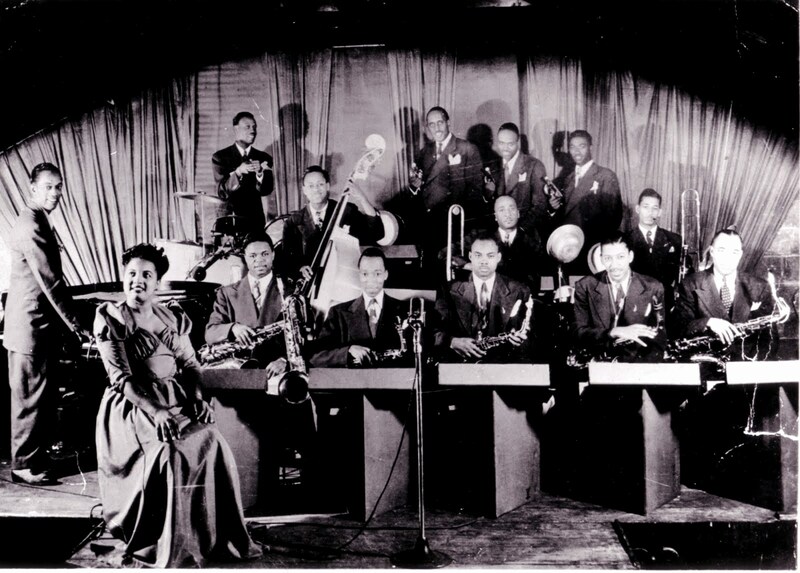 By 1944 Johnson was leading a full big band. It was a boisterous, brassy unit with a rhythm dominated by a strong back beat that became increasingly heavy as the years progressed. Along with Johnson’s talent as an arranger and composer, a major factor in the band’s success was younger sister Ella. She joined big brother Buddy in New York while still a teenager and started recording with his band in 1941. She sang ballads and blues with a uniquely terse and straightforward style completely lacking in histrionics. Her singing served as a nice contrast to the shouting riffs, honking tenor saxes and hard-hitting rhythms of the band. Johnson built most of his arrangements on the blues. He said there was a touch of his home South Carolina in all of them; he always kept his music simple, understandable and danceable. That was the key to Johnson’s survival at a time when other big band leaders were throwing in the towel. Many big bands of the mid-to-late 40s, both white and black, had moved in directions that were too complex and impossible to dance to. They were creating art and concert music and not something people could move their feet to when out on a Saturday night. Johnson might have been keeping his music simple, but it wasn’t simple-minded. His charts were rich with thick textures and harmonies with occasional traces of modern jazz. There was always enough variety to keep things interesting, even within a limited blues framework. 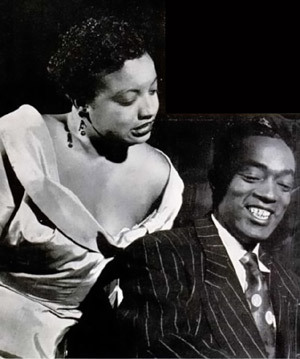 Johnson’s most famous composition is the ballad “Since I Fell for You.” Ironically, his original 1946 record of the song featuring Ella’s vocal wasn’t a big seller. It didn’t become a big pop hit until 1963 when Lenny Welch’s record of the song reached number four. In 1954 Johnson became a part of the burgeoning rock ‘n’ roll scene when he joined legendary disc jockey Alan Freed’s tour packages in which his band served as the primary accompaniment for the show’s singing acts. He was now recording for the Mercury label and while his music wasn’t that much different from what it had been a decade earlier, the beat was much heavier, the riffs simpler and honking tenor saxophone solos dominated. Johnson’s late Mercury records, especially December 1955’s “Doot Doot Dow,” demonstrate the dead end of big band rock ‘n’ roll. Here Buddy Johnson is moving from the simple to the simple-minded. The title is just as insipid as the monotonous, childish melody. Johnson is stuck playing repetitive piano triplets while the saxophones honk away on a tiresome two-note riff. (Admittedly the record improves once the band moves past the main riff.) All those horns just aren’t needed when playing such basic music and the musicians must have been bored to tears. Once Elvis Presley came along, big bands and even honking rhythm and blues combos were out, and stripped-down, guitar-based groups were in. Buddy Johnson gave up his orchestra in the late 50s and worked with smaller bands. He made a few more records before recording his last in 1964. After that both Buddy and his sister Ella retired from the music business and instead devoted their talents to the church. Buddy Johnson died in 1977 at the age of 62 after a long battle with cancer. Ella lived to the age of 80 and died in 2004. Buddy Johnson’s music might be overlooked by big band fans and critics, but when it came to explosive, high energy party music, there were few bands that could match the Buddy Johnson Orchestra. No, it wasn’t deathless art, but not everything has to be. Sometimes, you just wanna’ dance.